A blog about tripping across the country through epochs and once in a while tripping in the present! Malik Kafur, the feared general of Delhi’s Sultan Alauddin Khilji swept across South India and annexed Warangal in 1309. In 1310, the old capital of Hoysala Ballalas at Dvarasamudra was taken. After an expedition deep down to Madurai, Malik Kafur returned to his master with a booty loaded on 312 elephants, 20000 horses that included ten crore gold coins and a certain diamond known as Kohinoor. Six years later, prince of Devagiri – modern Daulatabad – Haripal Deva was killed by Mubarak Shah Khilji of Delhi. In 1323, Kakatiya’s Warangal fell. Entire Northern India and Deccan upto Krishna River was under Muslim rule. The ancient Hindu kingdoms of the south like Pandyas, Cholas and Cheras were probably quaking in their boots. Muhammad bin Tughlaq, eccentric and cruel, ascended the throne of Delhi in 1325. The quaking just got ratcheted up a few notches on the Richter scale. It seemed it was a matter of time before the remaining Hindu kingdoms would be subjugated and laid to waste. In his celebrated book ‘A Forgotten Empire (Vijaynagar)’, Robert Sewell says that after the incessant march of Muslim rule south of Vindhyas and Deccan, suddenly in about 1344 there was complete halt to the wave. 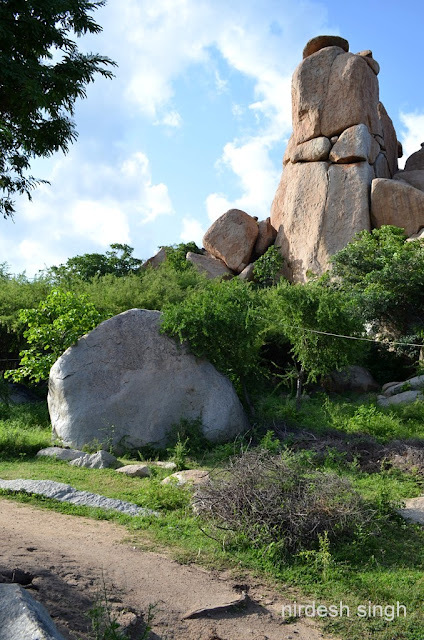 The check was caused by three small Hindu states: Warangal and Dvarasamudra that were already defeated; and the third was the tiny Anegundi which ultimately grew into the mighty Vijaynagar empire. The southern kings submitted to this empire. Dvarasamudra, 300 kms south of Anegundi, is the modern day Halebidu and a tourist magnet for the magnificient Hoysala temples. You missed this connection completely when you visited Halebidu last. Anegundi and Dvarasamudra will always be overshadowed by Hampi and Halebidu in the modern traveling context. 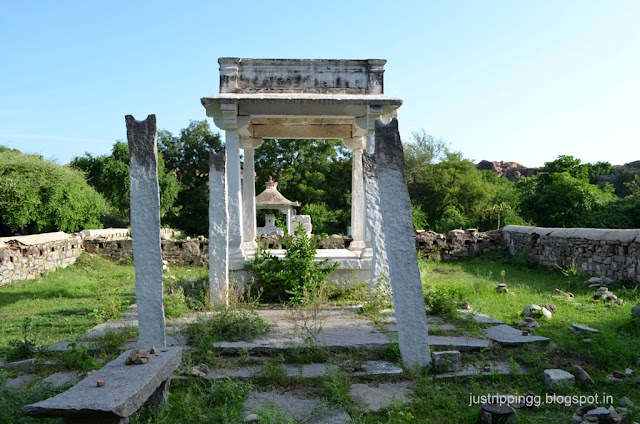 Warangal, in Telangana, with its devastated fort and Thousand Pillar Temple is about 600 kms north east to Anegundi. In about 1330, taking advantage of the incredible geographical feature of granite boulders piled high into loose hills, a family of chiefs, probably feudatories of Hoysalas Ballalas, built an immensely fortified citadel nestled in the hills and protected by the mighty Tungabhadra in the south. And so begins the journey of Hampi (Vijaynagar) from this unassuming small village of Anegundi. Firishta believes that the chiefs had existed as a ruling family for seven hundred years prior to 1350 AD. 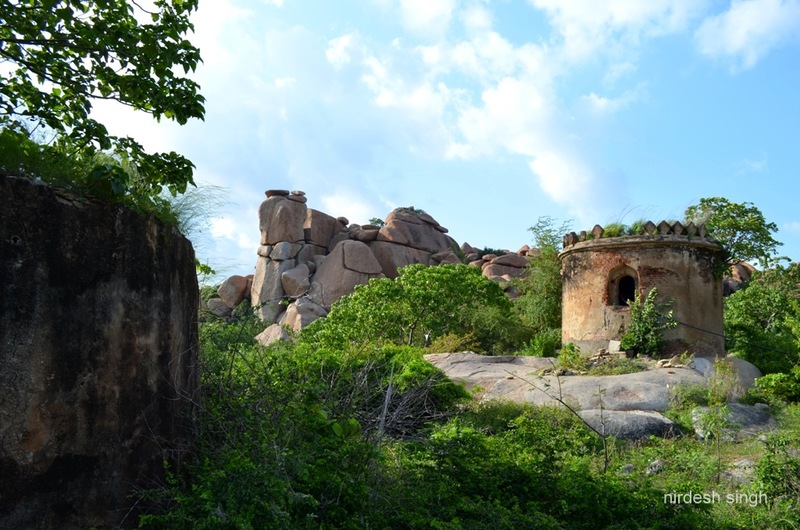 Sewell further says, that looking from the Hampi side, he would see the Anegundi citadel fortifications running across the hill but never got the chance to cross the river and explore to prove Firishta right. Let us go back into time to see how this happened. According to Sewell, there are several versions. Tughlaq, after overrunning Gujarat, marched southwards against his rebel nephew Baha-ud-din Gushtasp who had taken refuge with the king or Raya of Kampli. 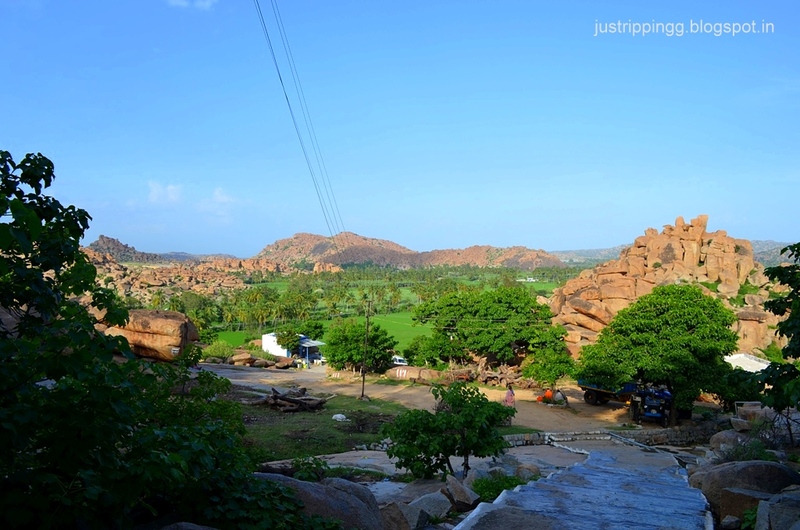 Kampli is a small town about 25 kms from Hampi. Raya sent the nephew to Dvarasamundra and himself shifted to Anegundi where the chances of defending against the Sultan were better. The year was possibly 1334. Raya was killed, the fortress of Anegundi seized and his eleven sons taken prisoners and converted to Islam. The Sultan chased his nephew southwards, skinned him alive and had his flesh cooked with rice. The skin was stuffed with straw to be exhibited throughout the country along with the identical remains of Ghiyas-ud-din Bahadur Bura of Bengal. Tughlaq certainly had his soft side. Back in Anegundi, the Sultan left Malik Naib as the governor and probably came back to Delhi. He was missing the daily spectacle of trampling of denizens by elephants at his swank Hazar Sutan palace in Jahanpanah Delhi. 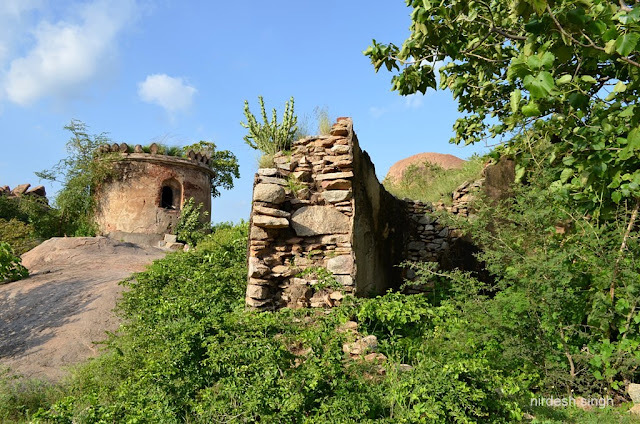 Anegundi’s local population rose against the usurpers and the kind hearted Tughlaq restored the kingdom back to Hindus by installing Deva Raya as the Raja and his brother Bukka as the Chief Minister. In 1336, Deva Raya or Harihara Deva I founded the city of Vijaynagar on the other side of the river with the help of great religious teacher Madhav. The river along with the boulder hills would provide better protection against the marauders from the north. Bukka succeeded Harihar and ruled for thirty seven years. This version is almost true since we know Vijaynagar was established by the brothers Harihar I and Bukka and the third king was Harihar II, son of Bukka. 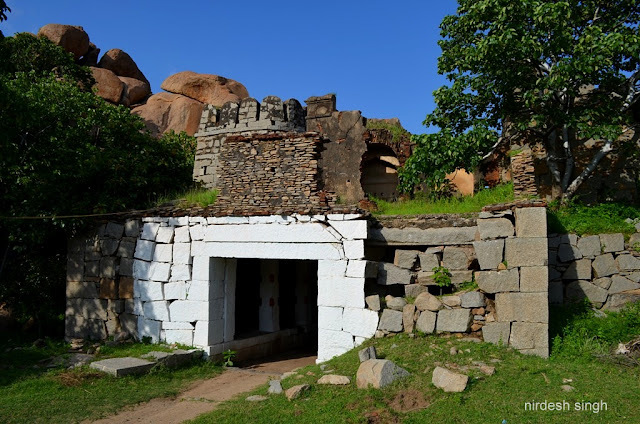 Other accounts say that the brothers Bukka and Harihar, were in the service of king of Warangal and escaped to Anegundi when Warangal was attacked in 1323 and were accompanied by the Brahman Madhava or Madhavacharya. 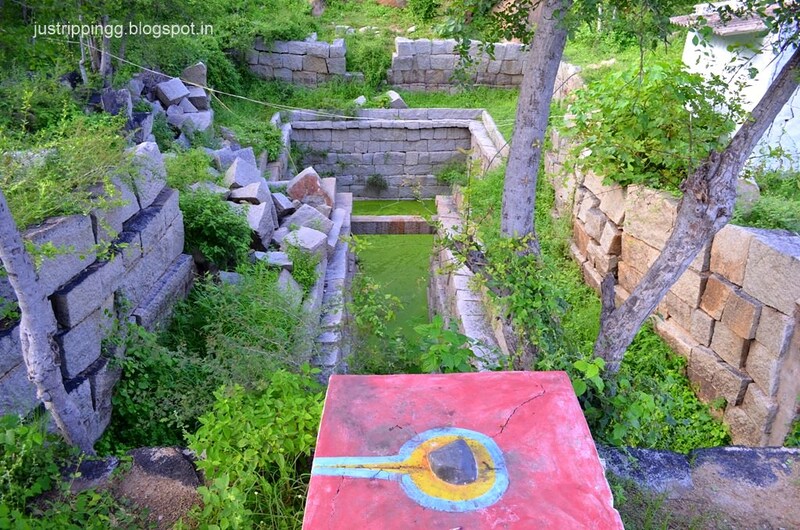 Another account says that the brothers were officers of the Muslim governor of Warangal who were part of expedition against the Hoysala Ballalas. The brothers’ battalion was probably defeated and they fled to Anegundi where they met the recluse Madhava and established the empire. Still other accounts say that the brothers were feudatories of Hoysala Ballalas, while some accounts say it was the hermit Madhav himself founded the city of Vijaynagara. To put things in perspective, Ibn Battuta was visiting India during these years of 1333 to 1342 and was a member of Tughlaq’s court. The first account of the Raya being slain and his sons converted has been corroborated by Battuta who seemed to have met them. This is getting interesting as you have already covered these events in a post on Delhi’s Fourth City of Tughlaqabad; same Tughlaq guy – eccentric, tyrant and smart - now playing in a parallel new arena. So what happened in the year 1344? Apparently, Krishna Naik, son of Rudra Deva of Warangal, Ballala Deva of Dvarasamudra and Bukka combined to first free Warangal. The Muslim governor Imad-ul-Mulkh retreated to Daulatabad. Soon other kingdoms of the South joined and Muslims were expelled from Deccan. The southern kingdoms reportedly submitted peacefully; perhaps just glad to keep the foreigners out. 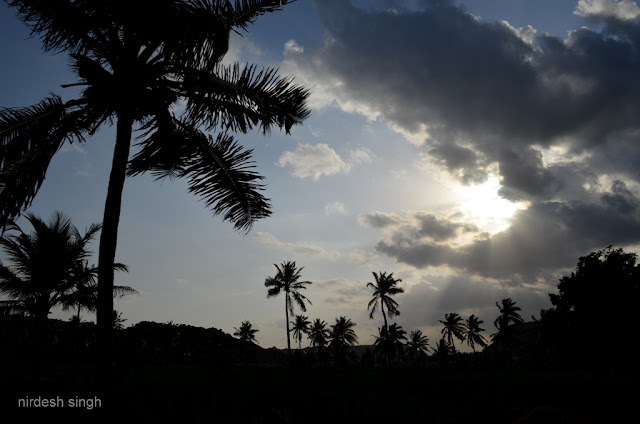 The tiny principality of Anegundi gave birth to the kingdom of Vijaynagara that soon expanded to become an empire. Abdur Razzak, an envoy from Persia who visited in the early 1440s, reports that Vijaynagara stretched from sea to sea and from Deccan to Cape Comorin heading an army of eleven lacs troops. All Muhammad-bin-Tughlaq was left with was Daulatabad. The peace would be short-lived. Soon the Vijaynagar rulers will have to contend with the Deccan Sultanates that formed after revolting against Delhi Sultanate in 1347. 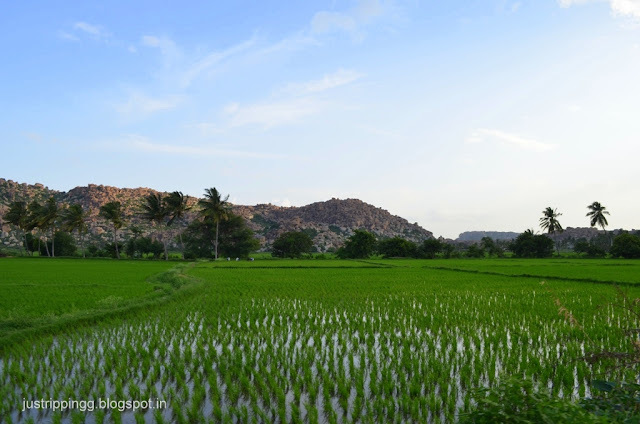 Enough of history - now let us go see what Sewell missed seeing from the other side of Tungabhadra. You drive west from Anegundi village. On the left rises the hill called Rishyamukha where Sugreev lived. 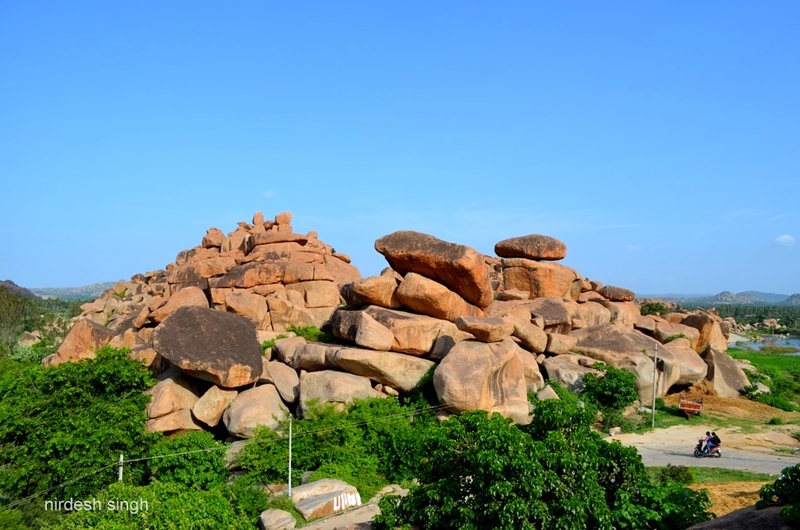 These are the most interesting hills you have ever come across – the hills are simply made of huge piles of boulders loosely balanced atop each other. 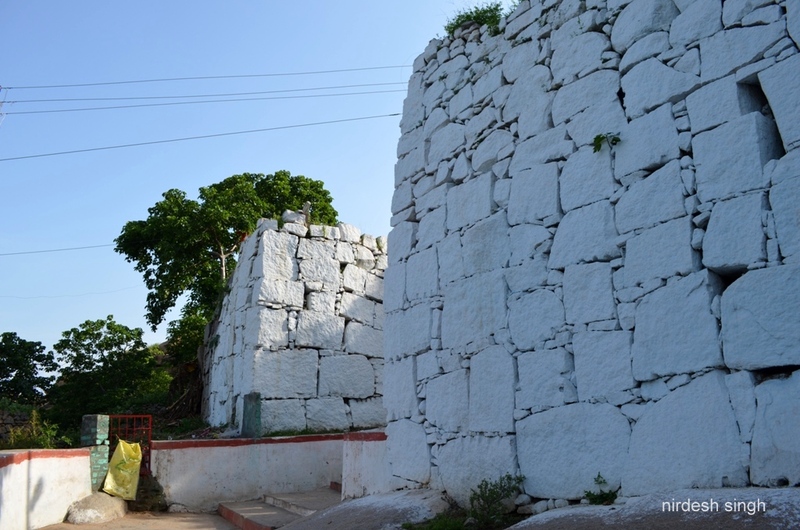 The first line of citadel walls can be seen as you drive around Anegundi area. These are the walls which Sewell looked at wistfully from across the river. A short steep ride brings you to the base of the hill with a parking spot and a kiosk selling drinks and snacks. This is when you discover the simple trusting life of a small town. The kiosk owner has to go run an errand. Your driver Muniswamy is deputed to take care of the store while he is gone – amazing; you doubt you will see something like this in a big city. 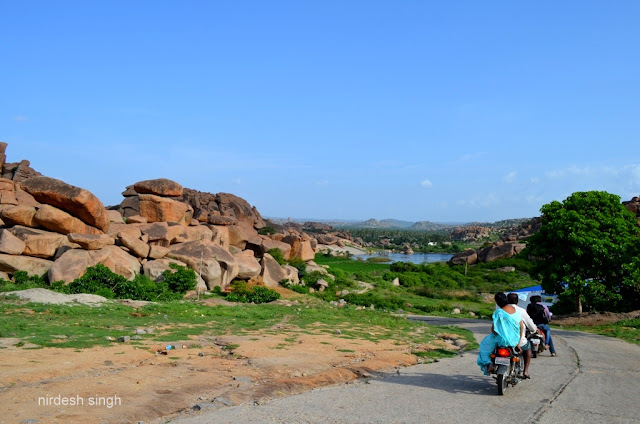 You take in the sights looking eastwards at the waters of Tungabhadra. 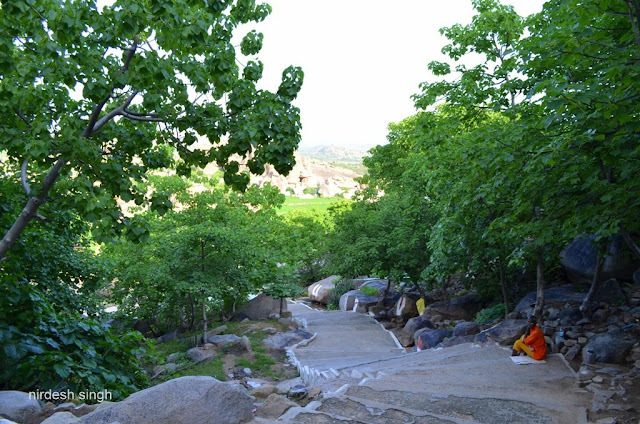 It is time to climb the Rishyamukha Hill. 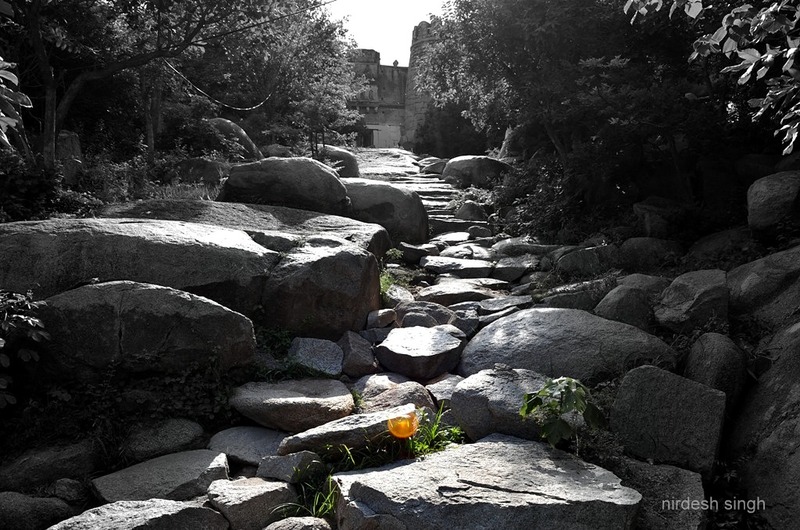 The steps wind around the boulders on both sides. You encounter the first fortifications. Here you turn left into a narrow doorway which probably later has been converted into Hanuman Temple. Up ahead, the path turns right into second line of fortifications. Here again the gateway is guarded by imposing square bastions. 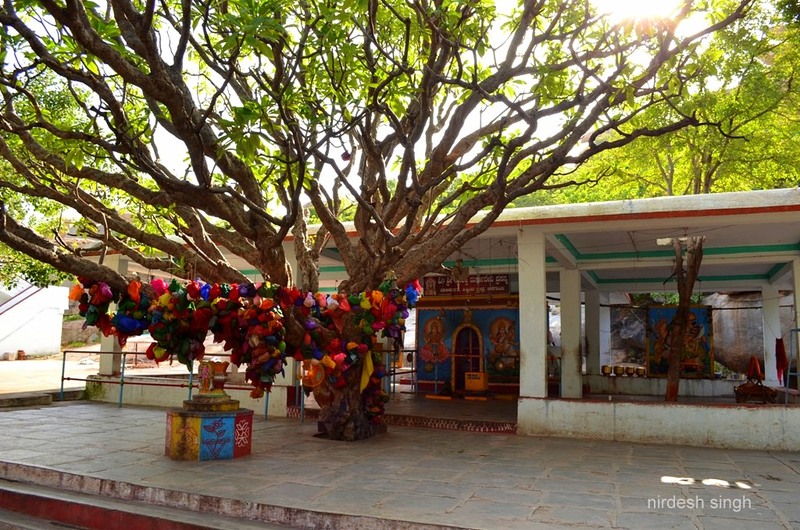 You cross the gateway to enter into the courtyard of the Durga Temple. The temple and other subsidiary buildings are all of recent construction. 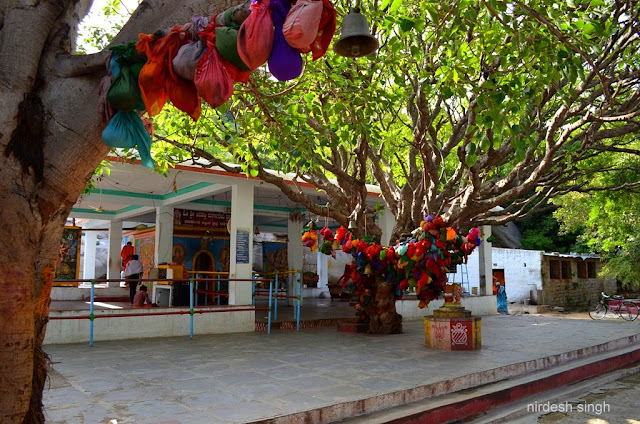 The best feature is the big tree with colorful strips of clothes tied around its branches holding coconuts as good luck charm. 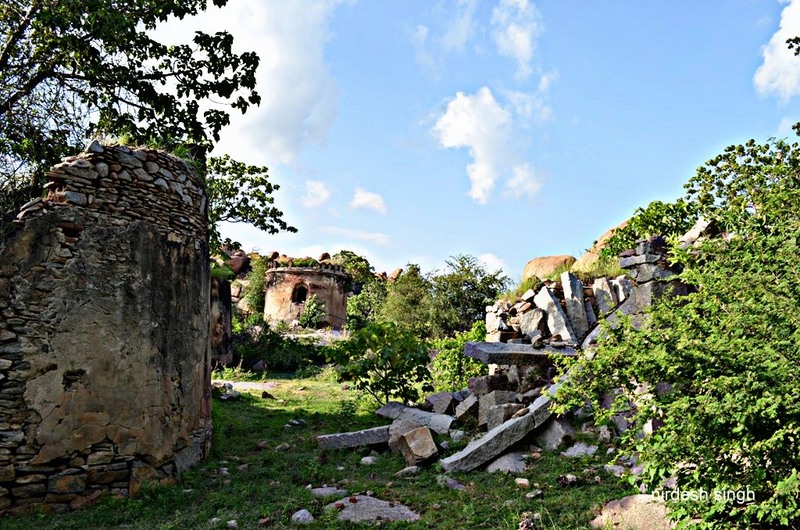 Just beyond, a boulder strewn path takes you to the main entrance of Anegundi Fort. Now this looks like a fort that you are familiar with. Tall imposing bastion like circular turrets guard the low gateway. The turrets are topped with kanguras or crenellations. On the top of gateway, a projecting balcony looks over the approach path. Guards probably kept an eye on the visitors here. 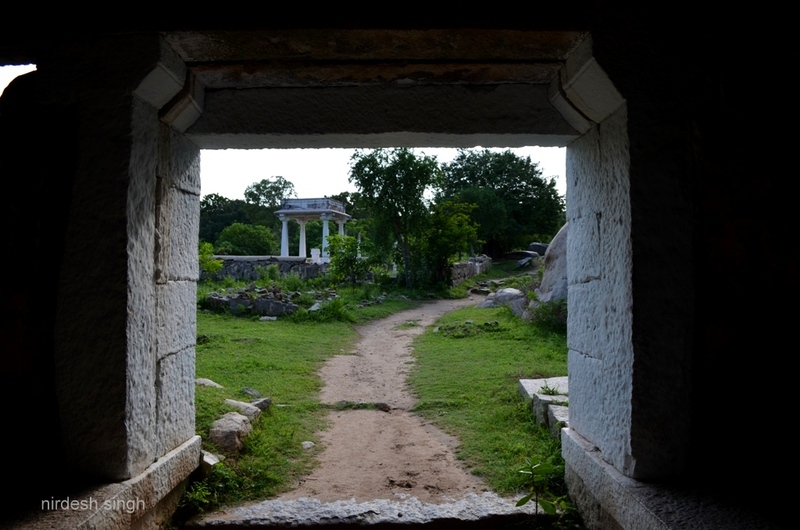 You haven’t seen these architectural elements across Hampi. 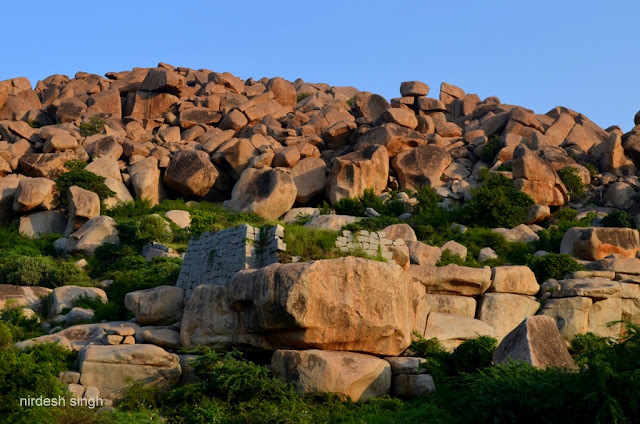 Were these constructed by the later Vijaynagar kings after the Battle of Talikota or were they constructed by the Deccan Sultanates? You are again not sure if the sultanate stayed back here or went back to their infightings and regular skirmishes with the Mughals. Beyond the main gate a path takes you straight into the fort. Surprisingly this is a comparatively flat stretch of land. On the right, boulders interestingly placed over each other create a possible watch tower. 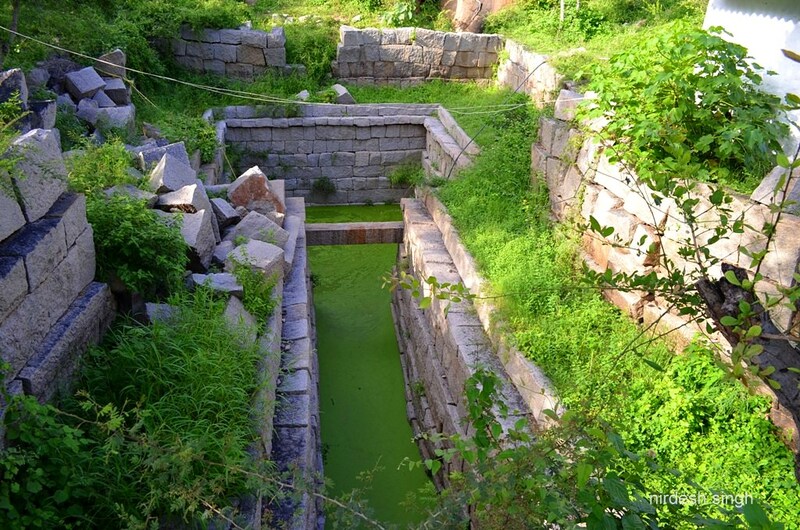 On the right is a small pushkarni or a stepwell. Water bodies are a feature of all forts across India. 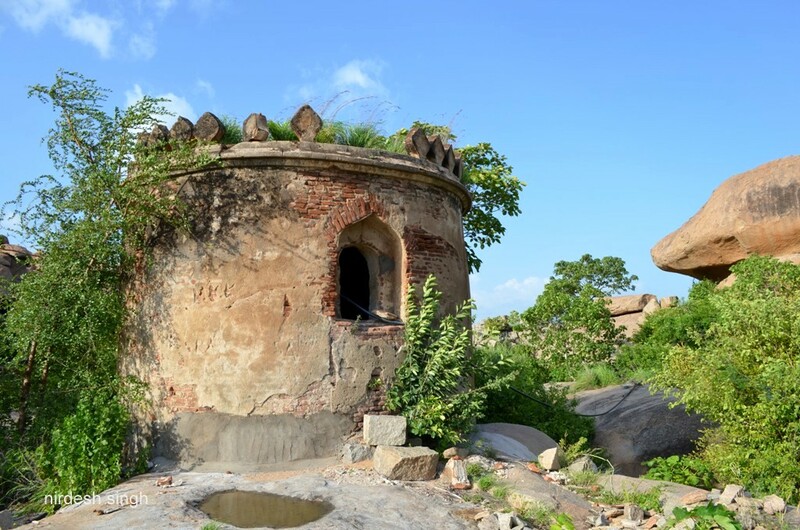 During times of siege, these water tanks sustained the inhabitants of the forts. For the first time, you encounter people in the fort. There is a local visitor and the priest. You exchange pleasantries. People are always intrigued with a person from far off Delhi in this neck of woods. Just beyond on the right, boulders create a cave with a temple. The man informs this is the Vaali Cave - Vaali Cave, really? Now this is a surprise. 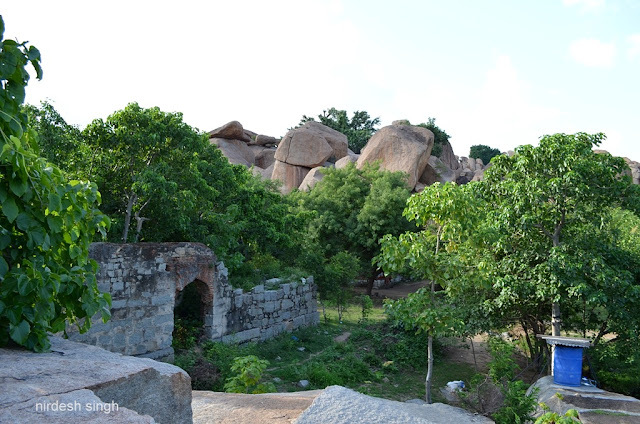 You have missed seeing the Sugreev Cave on your walk from Hampi Bazaar along the Tungabhadra towards Vitthal Temple. 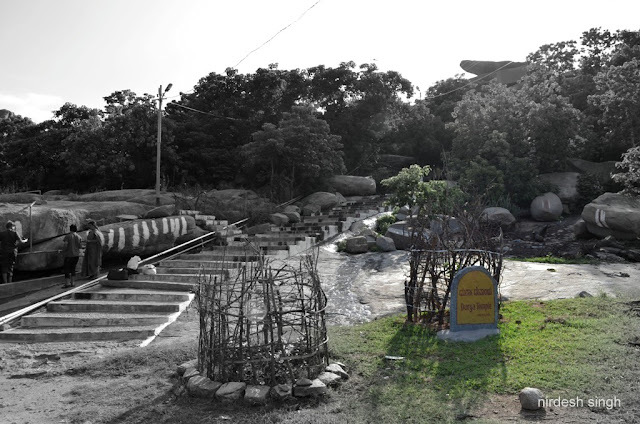 It is believed Vaali fought a duel with Mayavi asur in this cave and which was sealed off by Sugreev when he saw blood pouring out. In your excitement, it seems you forgot to take a close-up photo of the cave. 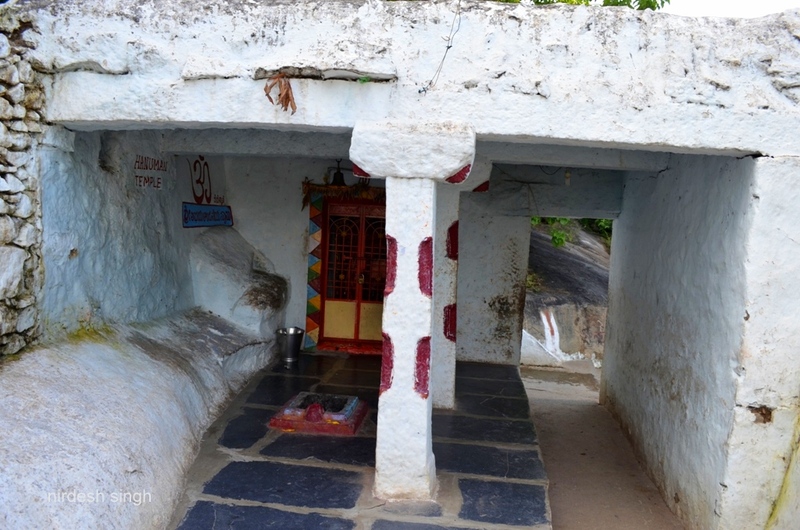 The priest further informs that the cave has a Hanuman Temple which is facing South. Usually Hanuman Temples face North. It could be unusual but not rare. Inside, there is standing Ganesh image with his wife Siddhi on left. 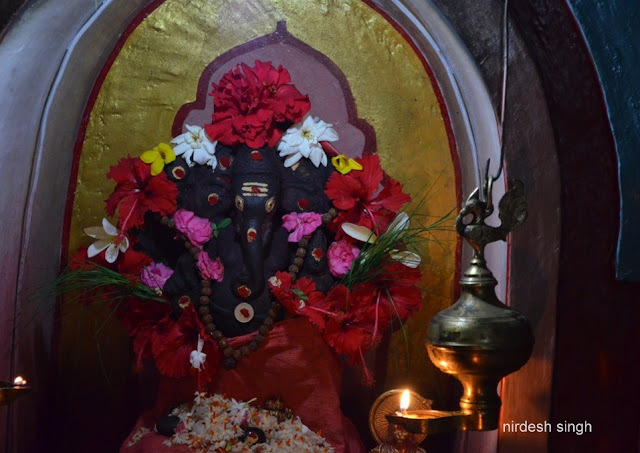 The priest believed that standing Ganesh is also rare and usually Siddhi is not seen. Iconography is not really your forte. And in matters of faith, reality is a casualty. You have no way of actually validating if this is Vaali Cave and if the idol dates back to Vijaynagar times. 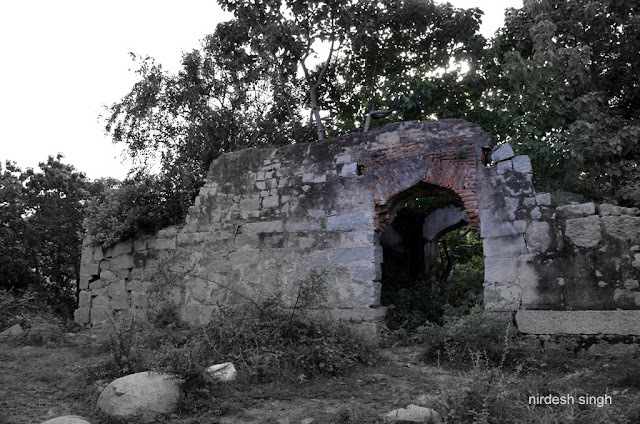 On the left a ruined gateway can be seen with the arch built of bricks. The Gagan Mahal in Anegundi village was built of bricks. 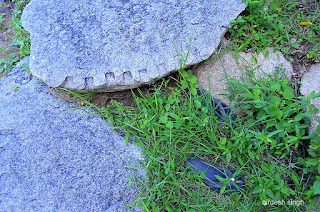 You do not remember seeing brick arches in Hampi though the shikars of temples are built of bricks. Again, you are not sure how old this structure is. And then you see these boulders that have serrated edges. 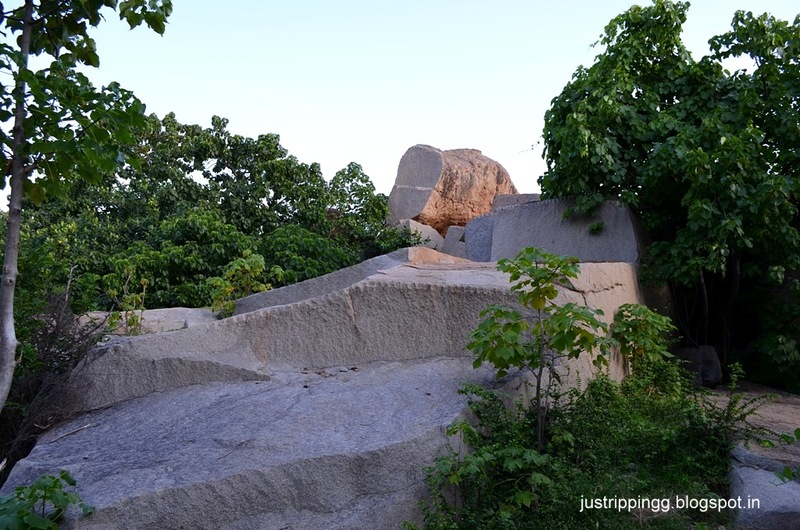 You have seen such sliced rocks across Hampi and Chitradurga. There was no need to gouge out hills. The loose boulders provided easy construction material. 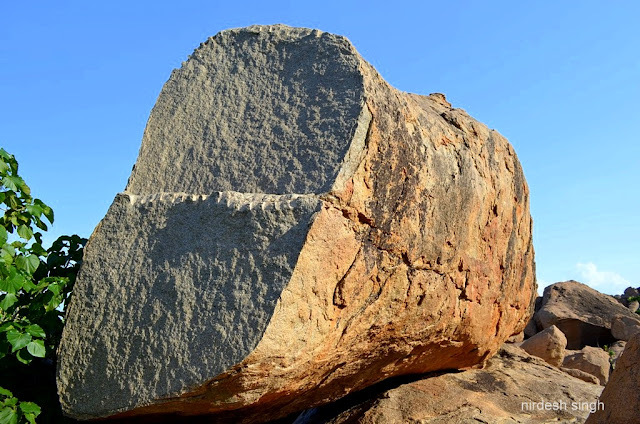 To break rocks, the workers drilled small closely-spaced series of holes in the rock. 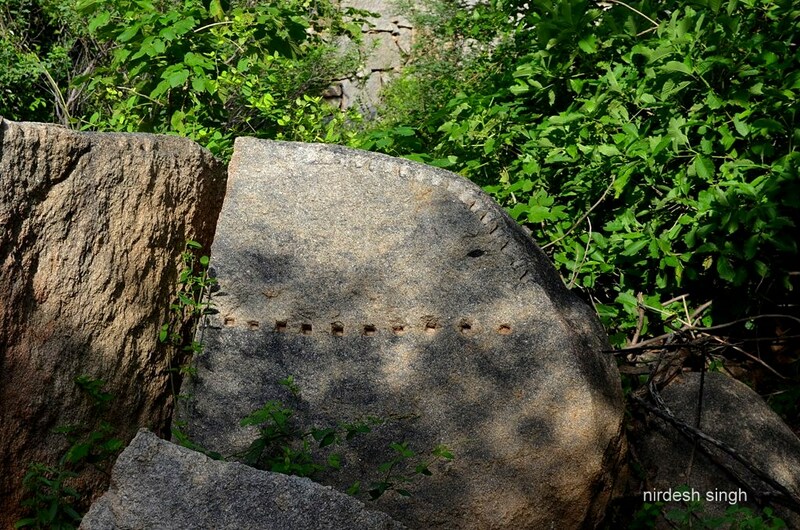 By gently tapping iron pegs wedged into the holes, the workers were able to split the rock precisely where they wanted. Water poured into the holes helped split the rock more easily. 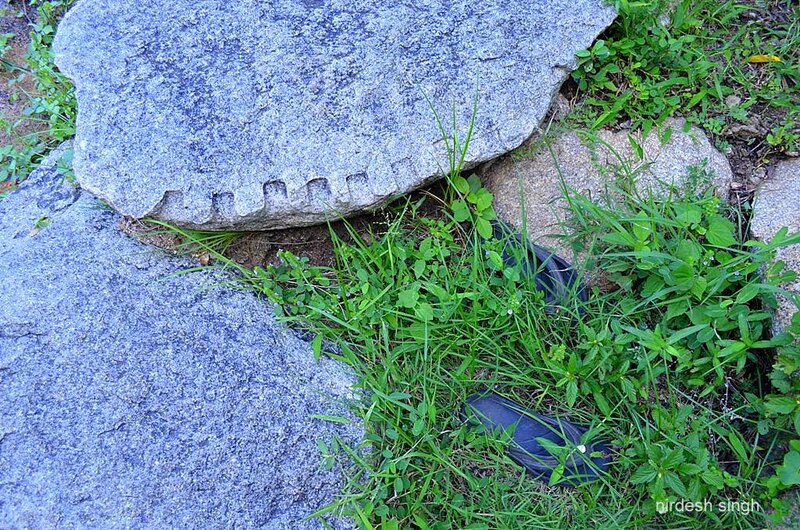 Sometimes instead of using iron pegs, the rock was gently wedged apart along the line of holes. So simple and so ingenious. Coming back towards the main gate you turn right to investigate. Within an enclosure you see few mantapas. One has only the pillars standing. The one behind survives with a seemingly later built parapet on top. The third mantap looks like of modern construction. The mantaps were possibly tombs or samadhis. Is it possible that one of these samadhis is of Ramaraya, the son-in-law of Krishna Devaraya? Tiny dolmen like structures have been erected by worshippers for good luck. You were mystified to see such rock arrangements at the Ajaigarh Fort in Panna MP. Walking further into the thick shrubbery brings you more surprises. Hidden here are three circular plastered structures built of brick and rubble. While one is in good shape, the other two are ruined. Arched windows can be seen in the structures. You don’t know if there is a window on the other side too. Now what can these structures be? Are these tombs or guard chambers? They do not seem to belong to Vijaynagara architecture. 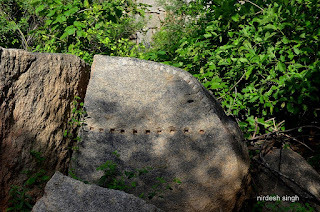 Rubble masonry and plaster was not Vijaynagar’s style. Were they built later by the sultanate victors? On top of the Ramayana’s Rishyamukha Hill, in Anegundi Fort, built by founders of the Vijaynagar Empire, hidden among trees with no one around, you find yourself in zone of bliss. Butterflies flit and charm, wispy clouds float in the blue sky, branches with flowers sway in the breeze - a moment when you are lost from the world. For company you have these strange looking structures and a crumbled stone mantap. It cannot get better than this. You want to stay here and stay lost to the world. It is time to wrench yourself away and start the walk back into the world. In a few hours you will be in another zone of bliss. Anegundi’s middle name is Bliss. You come back to find two foreigners sipping aerated drinks while Muniswamy is still commandeering the store. You need a drink yourself after the climb. After making some small talk, the fellow visitors drive off on their rented mopeds. This is the way to experience Anegundi – stay in the village, hire mopeds and just drive around. The coracles will take you and the moped across the river. The store owner arrives; ledger is balanced and cash handed over. Muniswamy has a surprise waiting for you just beyond. Did you say you could get used to the life here? Sewell would have been happy to cross the river and walk around the the fort. Maybe a century ago - his book was first published in 1900 - he probably would have discovered evidence that could have dated the citadel back to 7th or 8th century. 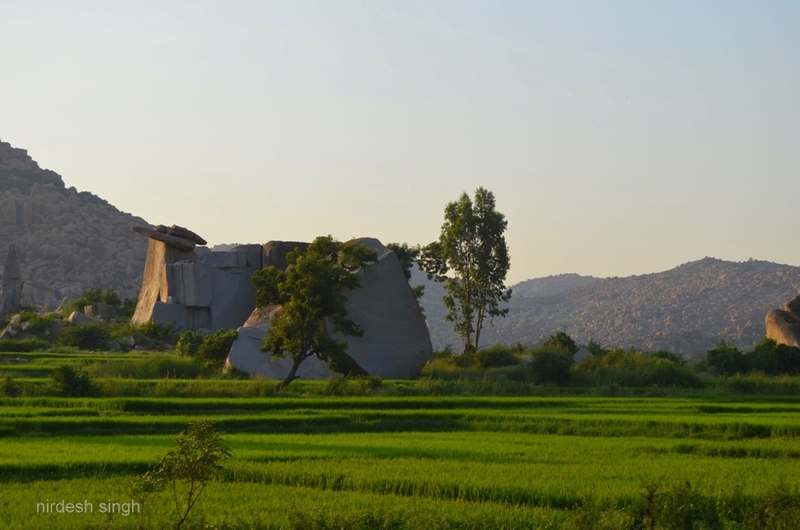 It was these granite boulders and the citadel that blocked the invasions from the North. These boulders have seen the goings on for 3000 million years. Anegundi is perhaps the oldest plateau on Earth. But you do wish that Vijaynagara, the City of Victory, had stayed unconquered and proud. 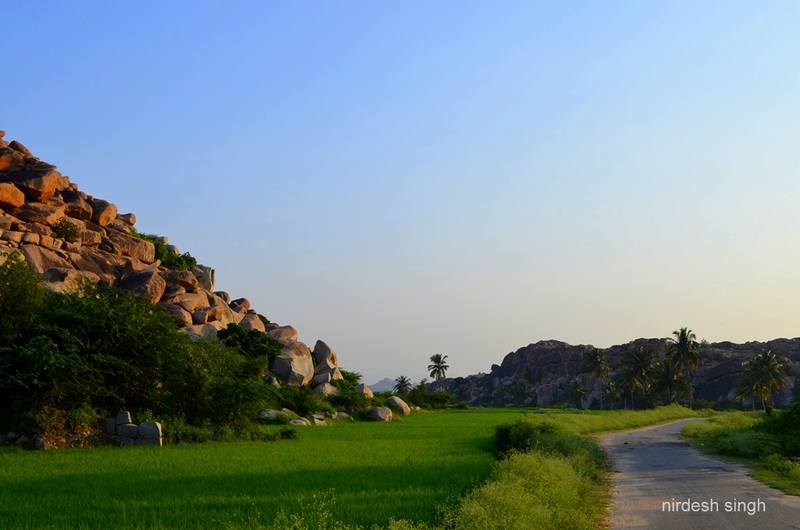 Standing on the banks of Tungabhadra, it would have been a marvelous sight to see the Vijaynagara elephants making their way back to Anegundi in the evening. 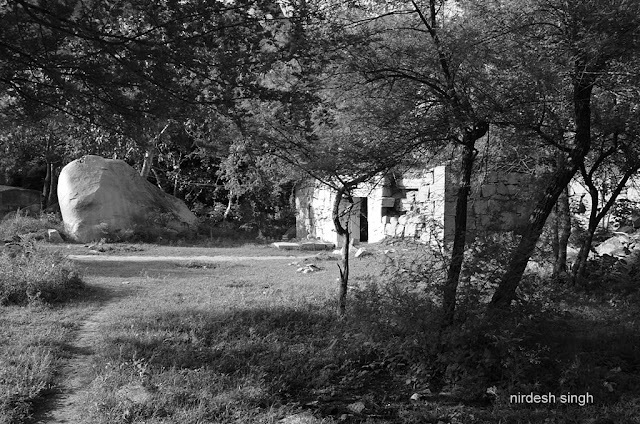 Anegundi literally means a pit or enclosure of elephants. But then who can challenge fate. What Malik Kafur started with Anegundi, the mother; the Deccan Sultanates ended by killing her child Vijaynagar. 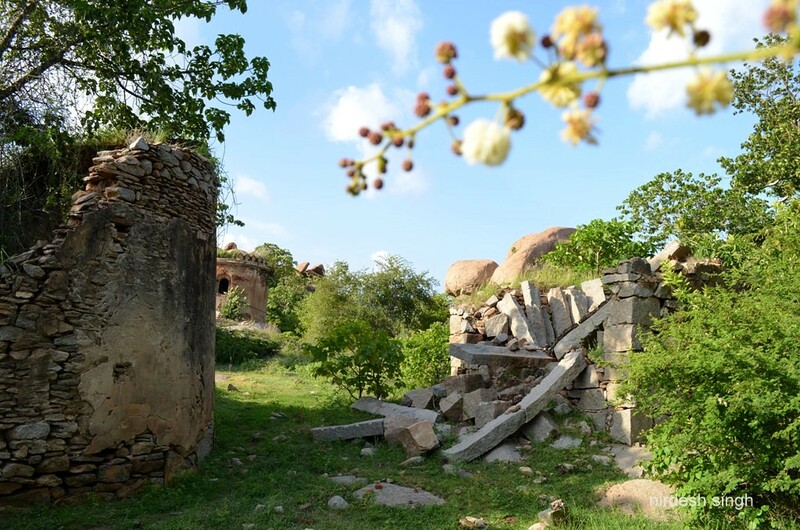 No boulders or fortifications or even the mighty Tungabhadra could stop the combined forces of the Deccan Sultanate from slaughtering the child who had grown into the glorious and youthful Vijaynagar. 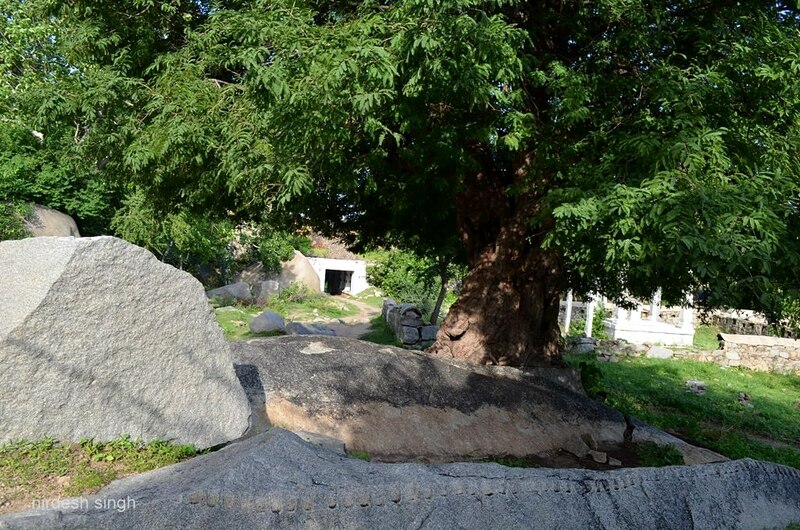 Vijayanagar, the child is gone but the mother Anegundi still lives on. Wracked by grief, Anegundi is stoic and dignified. She would not want Malik Kafur to see her tears. Even with her loss, we want Anegundi to live forever and be blissful always. Nirdesh ji it was a pleasure going through your blog. You have narrated the history of Anegundi fort so nicely. The pics are added asset to your writing. The best pic I found is the tree at Durga temple whose branches are beautifully spread and yet so mysterious. And at the end as you wrap up your chronicle the last lines which read -"Wracked by grief, Anegundi is stoic and dignified. She would not want Malik Kafur to see her tears"......brought tears to my eyes !! Looking forward to read more such blogs written by you !! All the best !! 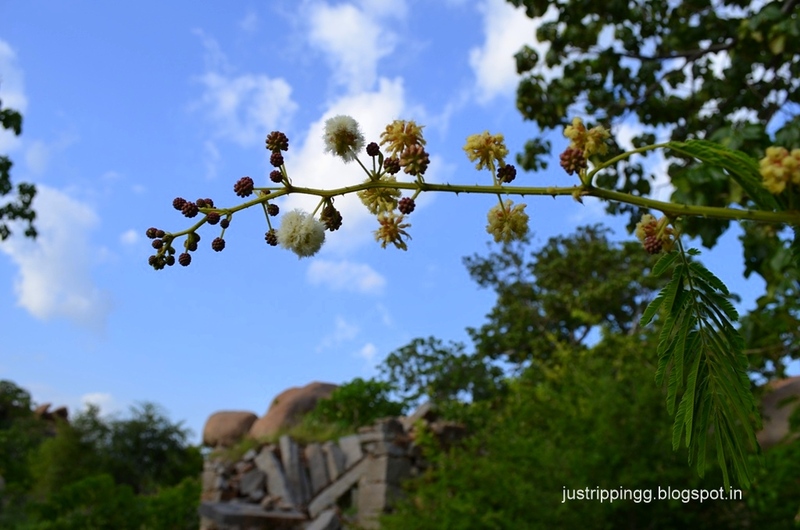 Thanks for walking through Anegundi's sublime yet tragic history. Do visit Anegundi and Hampi once. It is a life altering experience! 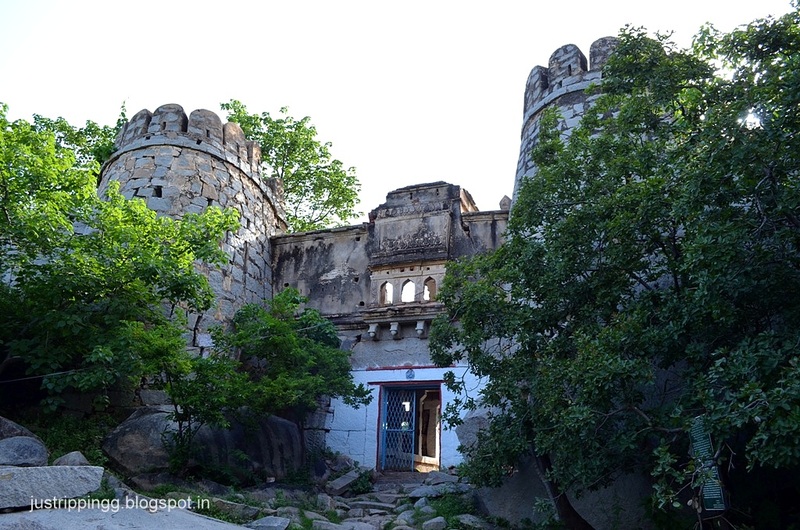 The Anegundi Mata has wielded her magic wand and transformed a travel writer into a historian ! Blissful indeed. Let me be totally honest here. When I began reading and as I continued on the time travel my co-passenger was confusion and somewhere along the post I totally got lost to the writer (zone of bliss). It is characters like Malik Kafur and Tughlaq that make history reading so much fun. The puny Anegundi fort and its tall tales of victory reminded me of David and Goliath. Only a few lines in between (enough of history now.... iconography is not your forte) broke my riverie and woke me up to the reality that I was reading a post written by Nirdesh! A fine read and a welcome change. Keep them coming dude. It is readers and friends like you who keep me going. Yes it has been a while that I have not included history in my posts. This seemed like a good enough time that I did. Thanks for your appreciation. You write so well and it is time you started your own blog. Well Nirdesh your post will definitely keep Anegundi alive forever and blissful always......keep it coming! Yes we want Anegundi to stay alive and blissful - always. 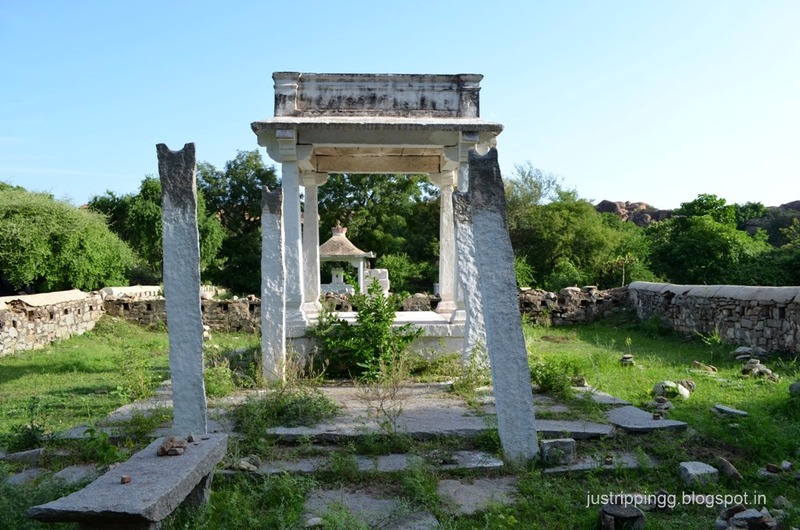 Day 3 of The Great Gujarat Road Odyssey: Vadnagar - Vad a Surprise!